Give your living space a handsome retro look with our Hexagon Rustic Wall Holder! Coming in 2 colours, this wall holder is perfect for showcasing photo frames, ornaments, plants and other decoratives. Besides, bring home our fairy lights for a classy look! Optimise your storage space with our Rustic Rear Door Hanger! Featuring a two-layer design, this unique holder allows you to hold up to 10 items easily, perfect for hanging towels, clothing accessories and even umbrellas. Furthermore, there is no need for drilling – simply hang and you’re all set! Functional and crafted with a timeless design, our Rustic Cups & Mugs Dryer is the perfect way to dry and organize your cups and bottles! By keeping your drinkware inverted and elevated after washing, this holder helps to dry them hygienically and quickly. Add a touch of retro-ness to your kitchen today! Slim, retro-designed and sturdy, our Rustic Rectangle Wall Holder (With Hooks) has everything you need in a hanging organizer. As its name suggests, it features convenient hanging hooks perfect for holding frying utensils, ladles, spatulas and even towels! Add a touch of retro design to your kitchen or bathroom with our Rustic Basket Wall Holder! Classic and functional, this hanging basket is perfect for organizing everyday essentials – ranging from kitchen accessories to toiletries. By hanging your items, you save space while improving accessibility! Looking for a perfect housewarming gift set for a loved ones’ new BTO home? Or are you simply looking to organize and improve your home? Our Bathroom Gift Bundle is specially crafted with a range of home essentials handpicked by us! 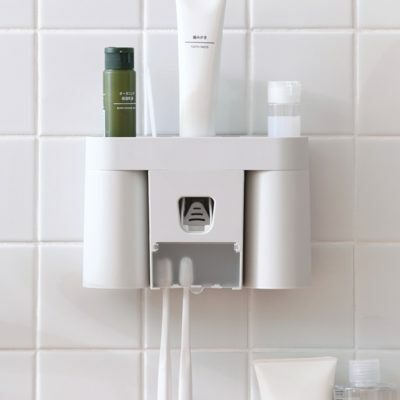 Simplify your bathroom routine with essentials that keeps your toiletries clean and organized. Great as gifts (comes in a box packaging) or for your own use, make your home full of smiles with us today! Note: Indicate your colour preference on the “Order Notes”, otherwise colours will be provided based on availability. Save 5% with our exclusive Bathroom Gift Bundle!